Last entry, I had the larger touchscreen working with X, and I worked out how to map the touchscreen data to a rectangular area on-screen. This time, I will try to get a Nintendo DS touchscreen working with X. Although my ultimate goal is to make a true USB device, for the moment I'm going to use an Arduino as the microcontroller. The Arduino has an FTDI FT232RL chip on it. This speaks USB on one side, and TTL-level RS-232 on the other. On the Arduino board, the FTDI's serial port connects to pins 0 and 1 of the Arduino, which is the microcontroller's UART port. This lets you send information to and from the microcontroller over USB, and what the PC sees is a USB serial port. My plan is to make a serial port based touchscreen which emulates one of the existing serial port touchscreens supported by Linux. Hopefully this means I don't have to write any kernel code. I looked around in the kernel's drivers/input/touchscreen directory for the serial port touchscreen driver with the simplest protocol. The most likely candidate seemed to be the driver for the 3M MicroTouch. It's a five byte protocol, and the driver looks pretty simple. I'll come back to the protocol later. For the moment, I want to see if I can read the touchscreen ok.
A touchscreen is a sandwich of two transparent plastic plates. Each plate is covered with a conductive film, and one plate is printed with tiny plastic bumps to keep the two plates apart when not being touched. You can find out more about how touchscreens work here. My touchscreen has four wires. These wires must be connected to the Arduino board, so I made my own "breakout" board. I used one of the Sparkfun connectors I bought to fix my Nintendo DS touchscreen. Soldering the touchscreen connector was "fun". Remember, there's four conductors in the space of 1.5mm. I had a lot of problems with solder bridges between the pins. I eventually solved this problem by using a jig made of polyimide tape with three fingers, which fit between the pins and make a physical barrier to prevent solder getting from one pin to the next. After completing the soldering, I removed the fingers. 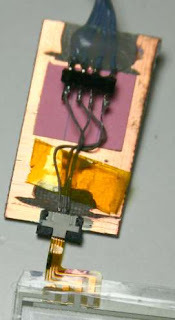 Polyimide tape is a heat-resistant film that is sold by DuPont under the name of Kapton. Cheap polyimide film can be bought here. The wire I'm using is wire-wrap wire. Four of these wires next to each other give exactly the right spacing. In order to prevent the tiny wires on the connector from breaking, I wanted to put the connector on a board. I didn't want to glue the connector, as there's a risk that glue will get inside. So I made my board out of a small piece of unetched printed circuit board, and soldered the connector to the board. The 4-pin connector has solder pads on the bottom: how to solder it to the board? Recently I bought myself a small tub of solder paste. This is a mix of microscopic solder balls, suspended in a liquid to make a paste. Although it looks a dull grey to the eye, I looked at it under the microscope at our hackerspace, and yes, it's a sea of unbelievably tiny balls. How cool! I used a pen to draw the dimensions of the connector onto the end of the PCB, then used a rotary cutting tool to remove the copper where the touchscreen conductors go. There's still copper underneath the solder pads on the connector, but no copper under the touchscreen wires. Using a jeweller's screwdriver, I applied a tiny amount of solder paste to the copper of the board where the connector's solder pads will go, and placed the connector. Holding the connector in place with my finger, I touched the soldering iron to the copper next to the connector. The copper conducted the heat into the solder paste, and I could see the paste turn from a dull grey to a lovely silver. I could also see surface tension pull the solder into a nice shape around the solder pads. Result: One nice strong strain relief for the connector and the wires. 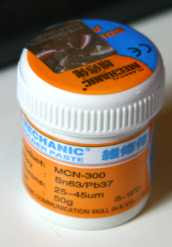 This solder paste worked very well, and I will definitely use it more in the future. I bought it very cheaply here. The breakout board is a bit rough, but it's a prototype. Well, that's the mechanicals done, now for some software! I love the Arduino for prototype stuff, specially interfacing you don't really know how it works (re-purposed stuff). Hi there. Nice blog. You have shared useful information. Keep up the good work! This blog is really interesting and gives good details. soldering wire manufacturers in India, soldering fluxes.